Machine: "At the tone, please leave a message." Ingeborg: "Ingeborg. Hiking, Tuesday. What time?" As it turns out, the 150 character limit on messages to Mars' phone only applies to e-mail messages, but Ingeborg didn't know that when she left the above telegram-like message. (Stop?) In any case, Mars apparently got the general idea, phoned back, and on Tuesday morning six of us gathered in the Icehouse Canyon parking lot for a private hike to Cucamonga Peak and Etiwanda Peak. Besides Mars Bonfire and Ingeborg Prochazka, there were Dorothy Danziger, Doris Duval, and Brian and Karen Leverich. Mars had already stopped by the ranger station and picked up a permit. 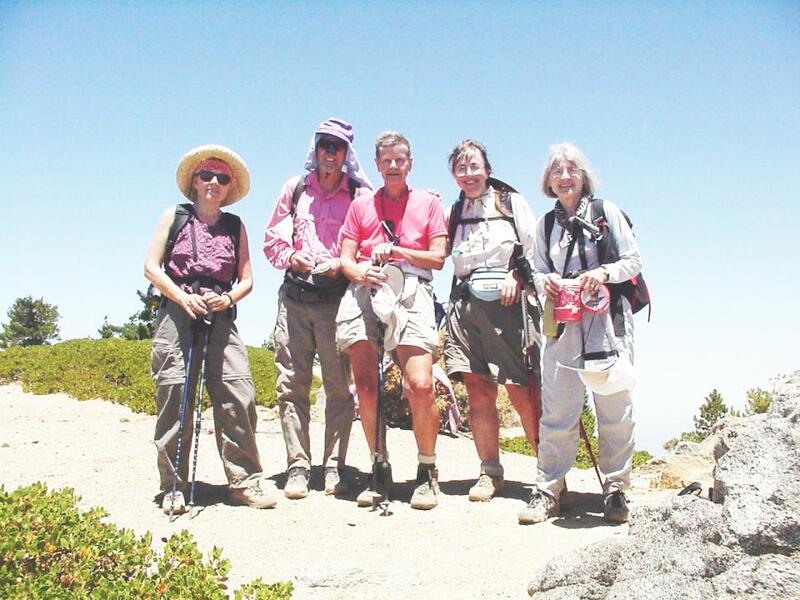 Dorothy had been up to Cucamonga Peak something like nine or ten times, so was drafted to lead the way. Someone commented at some point about how tiny she was, yet carrying such a big pack! "The sign of a leader," someone said, probably referring to the pack. Dense response: "Being tiny? Uh oh, Mars is in trouble..."
Tsk!) Bicycles are forbidden. Etc. This was intriguingly different from a similar sign I saw a few months ago, when I entered the Chumash Wilderness from the south. That sign forbade hanggliders. Does this mean they're OK in the Cucamonga Wilderness, or simply that they're a worse problem in the Chumash Wilderness? Imponderable, I suppose. Another mile up the canyon (this is one long canyon), and we turned off to visit Columbine Spring, crystal clear water tinkling out of the rocks under the trail. I thought it was lovely just as it was, but apparently until recently it had been shaded by a large shady tree that has since died and disappeared. It is now somewhat bare and open. When we stopped there on our way out, I saw a bright flash of almost metallic blue disappearing under a rock. Lizard? Snake? I wish I knew, I've never seen anything like it before. Milepost one, milepost two, milepost four. What's wrong with this picture? We never figured the mileposts out, but did eventually arrive at Icehouse Saddle, with views down Lytle Canyon to the desert, and a plethora of trails to choose from -- left to Timber Mountain, straight ahead down Lytle Canyon, slightly right and ahead to Cucamonga Peak, hard right to Bighorn Peak, harder right to Ontario Peak, and of course behind us back down Icehouse Canyon. And there may have been others, those are just the ones I can remember. At the saddle between Bighorn Peak and Cucamonga Peak, we took a break. Dorothy asked Mars if he was holding up OK. I mean, he's always at the back, it's natural to worry, right? "I'm doing fine," he said cheerfully, and added: "Besides, I really need these peaks!" This provoked some fine laughter. Mars, needing peaks, imagine! 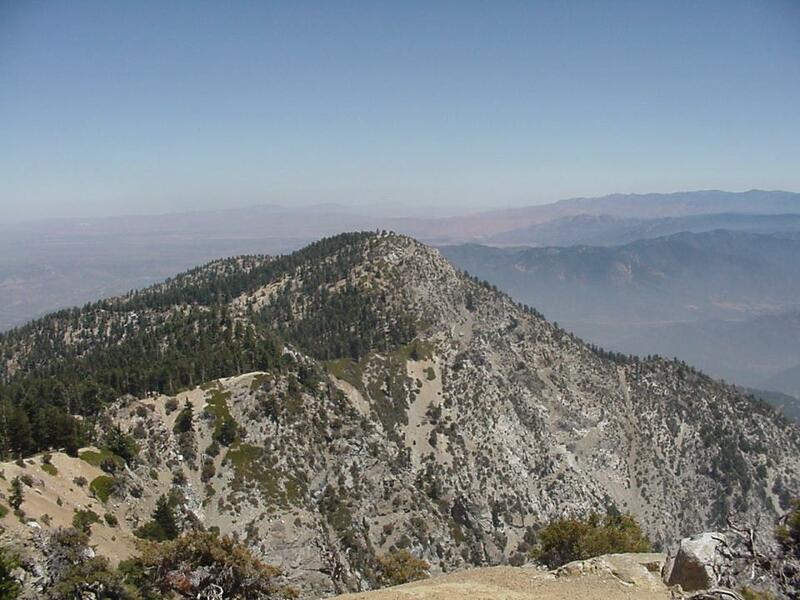 The view to the north was fascinating as we zigzagged our way up the face of Cucamonga Peak. Each time we turned, the ridges behind Bighorn emerged further, eventually dominating the northern horizon. Almost like a flower opening in slow motion photography, the mountains gradually appeared for us. We passed several cleared deadfalls. When Dorothy and Doris were here earlier in the year, they'd instead had to scramble over them. Dorothy complained to the ranger, and voila!, the trail was repaired. This is clearly a woman with influence, I'd be careful to not annoy her! from across a narrow ridge. Dorothy led us down, staying slightly left of the drop off. The trail reappeared, heading eastward through a pine forest. Eventually, we branched right up a use trail to our second peak. We all signed the register, noticing the peak isn't visited that much. I think Ping and Martin's names, from early in July, were the last ones before us. And there are these inviting use trails branching to the right hither and yon that look as if they might contour around and avoid all that gain. But Mars and Doris and Dorothy have tried most of them at one time or another, and hadn't successfully made it through on any of them. Never say die. We were willing to try again. At the very least, there had been that junction below Cucamonga Peak -- we had turned right and ascended, but the left branch surely went somewhere. Mars had noted the altitude, so on our way back up Cucamonga, we figured we'd take a use trail at a similar altitude, and maybe a miracle would occur? "Mars isn't going to get us into trouble," Dorothy reassured us. "If Mars leads, we'll get there." And of course she was right. Though the use trail we turned off on petered out pretty quickly, Mars detected the real trail slightly higher up the hill. We all scrambled up. Doris, Ingeborg, Brian and I took a short break while Mars and Dorothy headed back east to scope out how this trail interacted with the one between the two peaks. They would have built a duck, except it turns out Dorothy had already put one there. Then we all headed west and arrived at the expected intersection. Hurrah, we had avoided all of 200' or so of elevation gain. Well, and we had a much better understanding of how the mountain worked. On the way back down, I waxed slightly philosophical. Isn't it a tad obsessional worrying peak counts? Wouldn't it be better to simply appreciate each peak on its own merits? Should we be able to count a peak when we can't remember anything about it other than that we've been there? (Ingeborg and I were racking our brains trying to conjure up a clear memory of Anderson Peak. Before you turn us in to the Peak Police, rest assured that we did eventually remember the peak.) The group was not receptive, but at least didn't toss me off of Cucamonga Saddle when they had the opportunity. On our way out through Icehouse Canyon, Dorothy and Mars pointed out Falling Rock Canyon. A real inviting name, huh? Dorothy tells me there's scree, and falling rock, and even a dry waterfall. Surely no one in their right mind would go there. 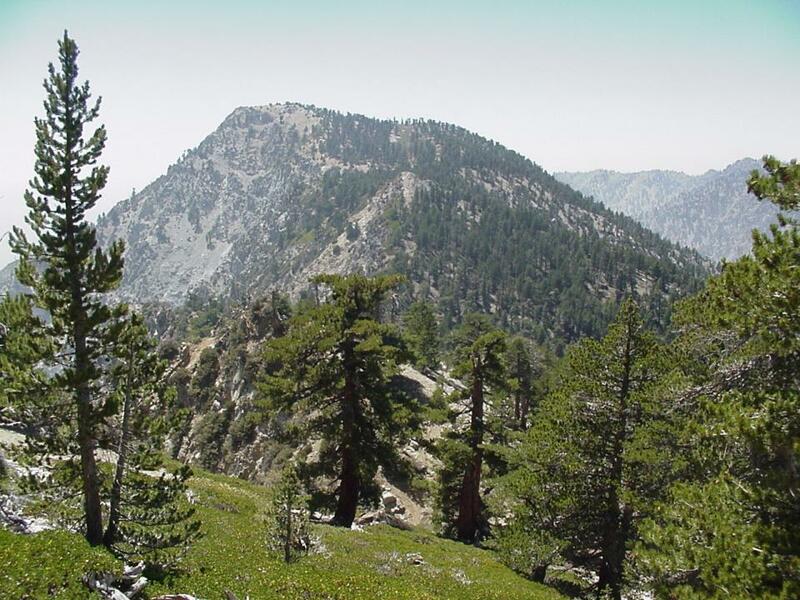 Er, no, wait: there's a hike next Tuesday to Bighorn Peak, Ontario Peak, and Sugarloaf Peak. I was going to sign up for that one, and the descent is by way of Falling Rock Canyon. This sounds like the world-class gully Brian was asking for just last Saturday. Um, I need to think about this... Why is it that getting off these peaks seems so much harder than getting onto them in the first place?